Not to be confused with World 4-4. Area 4-4 is the fourth course of Warped Mansion and the thirty-first course overall in Mario vs. Donkey Kong: Mini-Land Mayhem!. The Mini Mario begins on a platform on the middle level while the Mini Toad begins over to the bottom right and the Mini Peach begins over to the bottom left, with the Mini Mario door in the very center (blocked off from the Mini Mario), the Mini Toad door on the middle left, and the Mini Peach door on the top right. In order to reach them, the Minis must simply utilize the Green Pipes and Red Girders. The M-Token is located on the middle right, atop a platform on the middle level. To collect it, the Mini Mario must traverse a Red Girder platform from its starting position to it. 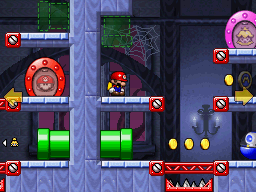 The Mini Mario Card is located on the top left, in an alcove on the upper level. A Mini must simply exit the left-facing Green Pipe entrance near it.